We sell a wide range of replacement drive belts available in popular sizes suitable for many diverse units; eg tape recorders, cassette decks, turntables, walkman, CD / DVD / XBox door tray drives, VCRs, 8 tracks, tools, models and toys. 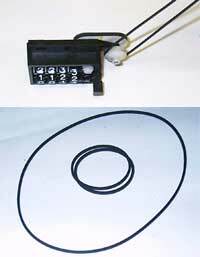 Replacement rubber drive band set, suitable for Revox A77 , B77 and PR99 Mk1 tape counter. B77BELTKIT comprises two short drive belts to replace the old toothed belt and one long drive belt to link to the take up spool. The original Revox toothed belt has a tendency to get brittle with age but these neoprene rubber replacement belts will remain stable for a long period. Please note, these are not Revox original parts but they are compatible and guaranteed to offer a reliable, budget repair option.